Television has become an ever-growing source of hit toy characters. Nickelodeon´s "Sponge Bob Square Pants," profiting from a major feature film, has become wildly popular, with a new product spin-off Spongebob Squarepants Krusty Krab Cash Register by Wild Planet Toys. The new version of Fox Box´s "Teenage Mutant Ninja Turtles" has sparked many new toys, including Teenage Mutant Ninja Turtles Skatin´ Raph Action Figure by Playmates. Marvel Comics superheroes are still big sells and spark great toys, like X-Men Animated Storm Action Figure by Toy Biz. Pokemon, still ahead of Digimon, keeps boosting sales of toys like Pokemon Rayquaza Deluxe Figure by Hasbro. 1.) Nickelodeon – “Fairly Odd Parents” and “Spongebob Squarepants” are hugely successful, with the latter benefiting from a major feature film. Some popular product spin-offs include Fairly Odd Parents Small Floppable Fairies: Cosmo/Moon by Flying Colors ($7.99) and Spongebob Squarepants Krusty Krab Cash Register by Wild Planet Toys ($21.99). “Danny Phantom” is gaining on favorite “Jimmy Neutron,” which has spawned The Jimmy Neutron – Boy Genius: Build & Blast Air Rocket by Mattel ($19.99). “Dora The Explorer” is on the rise and one of the biggest successes overall for young girls, while “Rugrats” and “Wild Thornberries” are still holding up well. 2.) Cartoon Network – The CG-made “Foster’s Home For Imaginary Friends,” plus “Code Name: Kids Next Door” and “The Grim Adventures of Billy & Mandy,” are the latest in a series of popular originals growing in fan awareness. 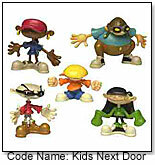 Code Name: Kids Next Door Action Figure Set (five in all), sold exclusively by CartoonNetwork.com ($12.99), allows kids to play at home. Quirkiness has been the key, which makes “Atomic Betty” the next big bet. Still, classics like superhero franchise DC Comics speak to a new generation through “Justice League Unlimited,” with Justice League Deluxe Mission Vision Superman and Batman coming soon from Mattel, and the continuing hit “Teen Titans” giving birth to Teen Titans Launch Tower Playset by Bandai ($39.99). The animated “Star Wars – Clone Wars” from the creator of “Dexter’s Laboratory” is another recent highlight. 3.) 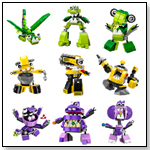 Fox Box – The new version of revival “Teenage Mutant Ninja Turtles” has been the big surprise hit for this block, sparking many new toys, including Teenage Mutant Ninja Turtles Skatin’ Raph Action Figure by Playmates (Gift Guide) ($7.99). “F Zero GP Legend” is a “Speed Racer”-like hit, while innovative shows by Shonen Jump are even more directly linked to Japanese Animé: “Shaman King” combines swordsmanship with the supernatural, creating a buzz around Shaman King Len 5” Action Figure by Mattel ($16.00), while “One Piece” stars a coming of age treasure-seeking warrior. Series on video game character classics “Sonic” and “Kirby” help video game sales while creating a market for new items like The Hedgehog Adventure 2 Battle Figure by Joyride Studios ($14.99). 4.) ABC Family Jetix – “Spiderman” and “X-Men” may be reruns, but Marvel Comics superheroes are still big sells and spark great toys, like X-Men Animated Storm Action Figure by Toy Biz ($9.99). “Power Rangers: Dino Thunder” somewhat revives another once-passé franchise, making Bandai’s Power Rangers: Dino Thunder 5" Red Ranger ($8.99) an impressive purchase, while creature and card-collecting phenom “Digimon” continues, branching out into other products with Digimon Agunimon Action Figure ($12.99) by Bandai. “Super Robot Monkey Team Hype Force Go!” and “Beyblade G Revolution” are their Animé-type hits holding their own ground. 5) Kids WB – The WB can celebrate making Animé series “Yu-Gi-Oh” a hit, with toys like Yu-Gi-Oh Kaiba Ship With Exclusive Figure by Konami ($24.99) one popular item. “The Batman” is the newest of many animated incarnations of Bob Kane’s legendary hero, with sales of items like The Batman Batcave Tower by Mattel ($34.99) poised for a boost next summer when a new live-action feature hits theaters. “Pokemon,” still ahead of “Digimon,” keeps boosting sales of toys like Pokemon Rayquaza Deluxe Figure by Hasbro ($7.99). “Mucha Lucha,” a Latino-identity show, is a rising star with serious toy tie-ins. It can take 12 – 18 months from a series’ first airing before tie-ins hit the market, but that still leaves plenty of character-generated hits to consider.